Thursday's Tasty Temptations picks up in chapter two of In My Wildest Dreams and the next mention of food. I haven't combed through the book to get an exact count of the food references but so far we're two for two. Yes, you guessed it . . . food is an important part of my life. The change of the season brings about cravings for certain foods . . . fresh garden veggies in the spring, watermelon in summer, and pumpkin in the fall. Football season screams nachos. Baseball and hotdogs go hand in hand. Overhearing a conversation about our Thanksgiving meal plans, my daughter, four at the time, said, "Oh goody, time for Maw-Maw's famous dressing!" Of course, for y'all not from the south, that would be cornbread dressing. Here is an excerpt from Lynzi's chapter two meal. I rolled over toward the clock on my bedside table. Six-thirty. I tried to get out of bed but the pain zinged through me like I’d been hit by a truck or at least, almost hit, by a van. Trying again, I eased out of bed and struggled to an upright position. I put on half a pot of coffee and opened the fridge to get some leftover chicken. After adding cream to an oversized mug, I settled into my recliner to eat my supper and watch a little television. Deep in thought about the events of the day and how blessed I was to have been saved from any real harm, I nibbled at my chicken and revisited the strange dreams I’d had earlier. The colors of the crystal clear, blue sky, the emerald green grass, the rustic, weathered red of the big old barn. All picture perfect, as if I’d been there. Then, the main attraction of those dreams . . . Layne Brady himself. God, I missed him. Why did he have to die before we had a chance to be together? There are so many variations on chicken salad. Along with the chicken and a dollop of mayo, some add fruits such as raisins, pineapple, apples, grapes, or dried cranberries. Some add pecans or walnuts. There's a variety of veggies, onions, bell pepper, or celery. The combinations are numerous. 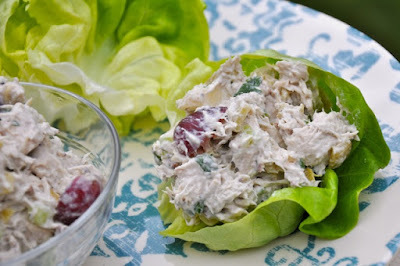 What are your favorite chicken salad ingredients?